The campaign begins with us. Get one SolarPuff for yourself to reduce your own carbon footprint, and one SolarPuff for someone in need. SOCIAL GOOD COMPANY SOLIGHT DESIGN IS THE EXCLUSIVE PROVIDER OF LIGHT FOR THE 10 MILLION RAYS OF LIGHT™ CAMPAIGN. TOGETHER WE HOLD THE SUN IN OUR HANDS. 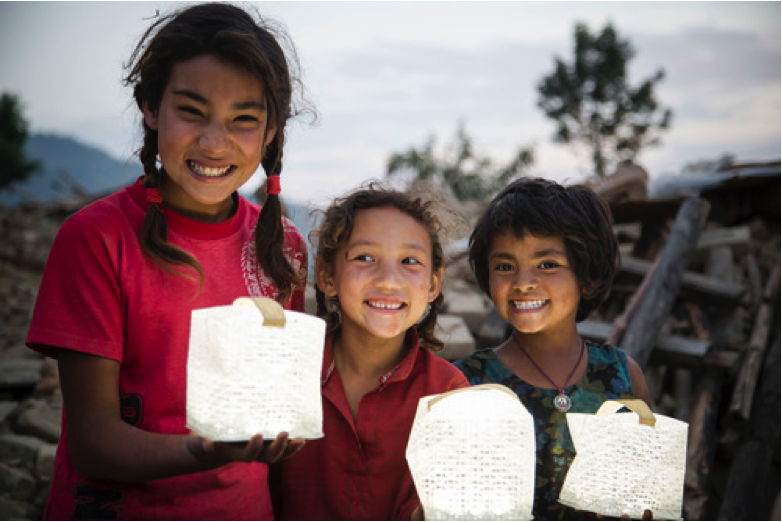 ALICE CHUN is the designer of the original inflatable solar lantern and founding CEO/President of Solight-Design™. Her mission is to get 10 million solar lanterns to the people who need them and significantly reduce our carbon footprint world-wide. Alice is a professor at the Parson’s School of Design in New York City. A design visionary, Alice is fully committed to her company’s focus of social benefit and the ongoing design of products embracing the sun as a renewable resource. ALISON THOMPSON, Rescue medic, volunteer, and Solight-Design™ evangelist is in Greece now distributing Helix TM solar lanterns to Syrian refugees. Alison has been spear-heading distribution of Solar Puffs & Helixes to Haiti, Nepal and Africa for several years. LARA LAVI is an award winning singer songwriter, attorney, producer and staunch environmentalist. She is the co-founder & co-lead singer of the SongCatchers and general counsel for Solight-Design™. TINA LIBERIO LANG is a social media specialist and has over 40 years in the entertainment industry working as an owner of the famous Robert Lang Studios in Seattle, WA which has been the recording home over the years of such greats as Foo Fighters, Dave Mathews, Peter Frampton, Nirvana, Death Cab For Cutie and countless others. Tina's work with celebrities, labels and emerging artists make her invaluable as the point person to manage celebrity endorsements and keep the Campaign's social media up to date and full of all the fresh content that pours in from this social good effort.